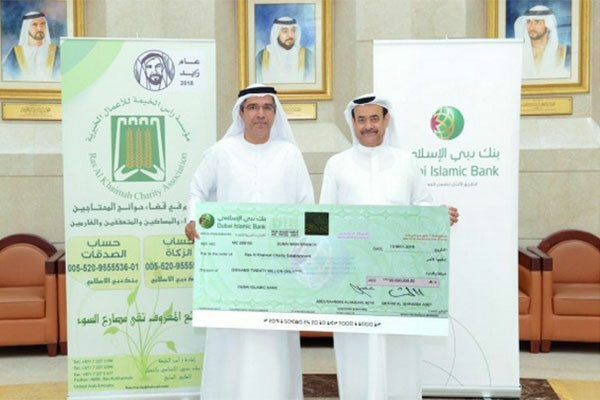 The Dubai Islamic Bank (DIB) has donated Dh20 million ($5.4 million) in Zakat money to the Ras al-Khaimah Charity Association, as part of its efforts to support social and charitable societies and associations. Abdul Razzaq Al Abdullah, head of the Community Services Department of the DIB, handed the donation cheque to Abdulaziz Al Zaabi, chairman of the Board of Directors of the Association, reported Emirates news agency Wam. The association will distribute the funds to those eligible for Zakat though legitimate channels during the month of Ramadan. Al Abdullah noted the bank’s support for the humanitarian and charitable work of national charity organisations, especially the Ras al-Khaimah Charity Association, due to its expertise in assessing the urgent needs of poor people in Ras al-Khaimah, while adding that the bank’s initiatives aim to promote its role in encouraging social responsibility among Islamic banks, based on the tolerance of Islam. Al Zaabi thanked the DIB’s management for its generous support and considerable donation.